Get organized with this handy device that can reduce the rat’s nest of plugs and wires. A power supply is perhaps not a very glamorous or exciting project, but this one is very useful. It replaces ten DC wall-wart sup plies, thereby freeing up nine AC outlets. And this, in itself, is a worthwhile accomplishment. 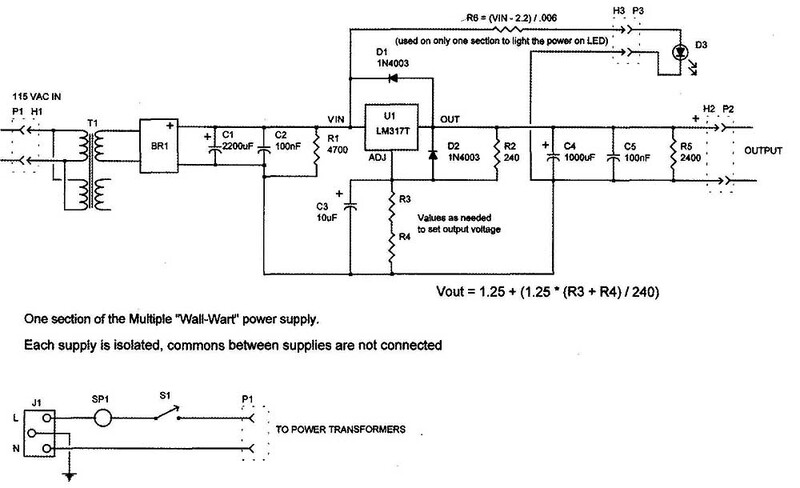 FIGURE 1: Multiple wall-wart” power supply circuit diagram. One section of the Multiple “Wall-Wart power supply. Each supply is isolated, commons between supplies are not connected. Each output voltage is isolated from the others so there is no common return or ground. I have operated the prototype unit continuously for over three years with no problems. I chose to make nine of the outputs 24V DC, with the tenth one at 14V. The output voltage is easily settable with two 1% resistors, so you can choose whatever voltages you need (up to about 30V) with the transformers in the parts list. If you set all the outputs to a lower voltage, using a transformer with a lower secondary voltage would minimize power dissipation in the regulators. This is closely approximated by choosing standard 1% resistors of 4120 and 249 ohm. Because there are two secondary windings on each transformer, two sup plies share a transformer. I considered using one large circuit board, but on second thought this didn’t seem like a practical idea. I settled for two different boards: one for four supplies (two boards needed), and the other single board for two supplies. 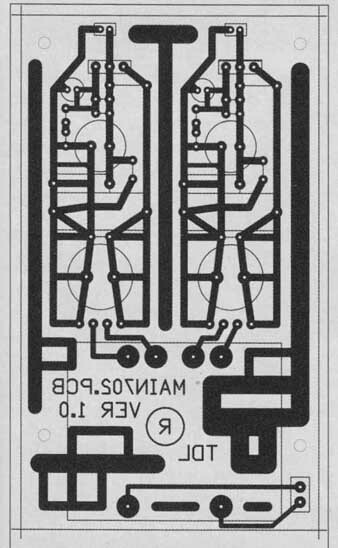 The Circuit board layouts (single-sided) are shown in Figs. 2 and 3. 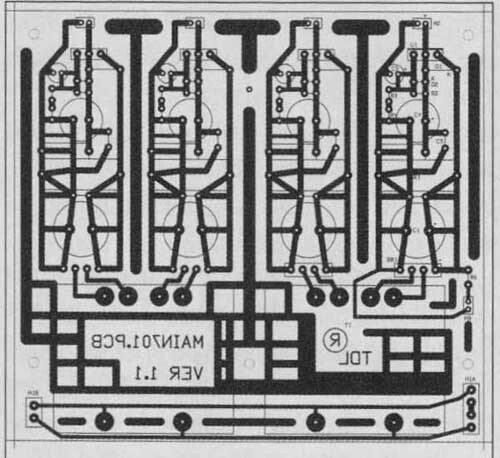 (You can download the layout files from the TDL website.’) I named this supply a Model 701 (just to keep track of circuit boards and parts), but it is not a product, and I have built only the one prototype. Hence, the front panel has no labels. PHOTO 1: Multiple wall-wart power supply inside view. The inrush current limiter, SP1, is directly wired to the fused, IEC AC power input connector. PHOTO 2: Multiple wall-wart power supply inside view. After mounting the circuit boards, measure the distance from the aluminum heatsink bar to the rear panel and cut the 1/2” diameter aluminum rod to this length. (top) PHOTO 3: Multiple wall-wart power supply rear panel. During continuous operation, the panel is only slightly warm to the touch. 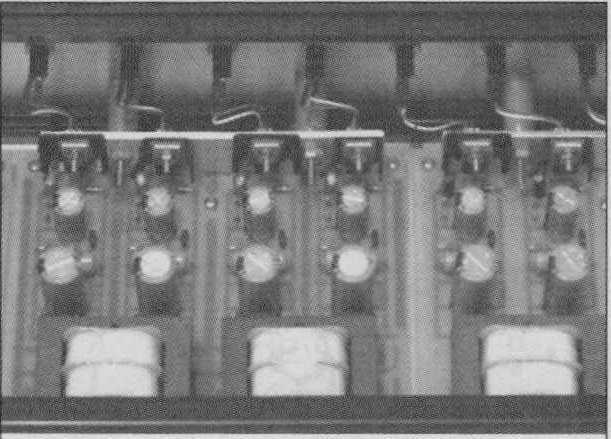 (above) PHOTO 4: Multiple Wall-Wart power supply front panel. The construction is straightforward and not critical. But because the circuit boards almost fill the enclosure, there isn’t much room for variation (Photos 1 and 2). It is important not to omit the inrush current limiter, SP1, because all five transformers are powered on when Si is closed and must charge a total of 22,000 uF (ten times the value of C1) at turn-on. I used 3.5mm insulated mono phone jacks for output connectors because they provide a positive, locking connection and have sufficient current capacity You could also use two-pin DIN or mini-DIN as well as 1%” insulated mono phone jacks. The circuit boards are attached to the enclosure bottom panel using ½” long nylon spacers and 4-40 x ¾” screws and 4-40 nuts. 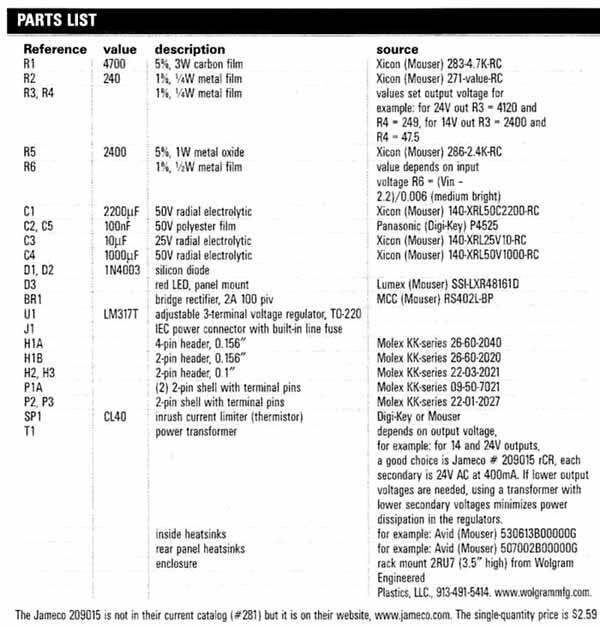 If all the output voltages are the same, no rear panel labels would necessarily be needed. But I thought it would be useful to keep track of which one was 14V. I used a word processor to print two rows of voltages on an 8½ x 11” sheet of sticky-back label, cut them into ½” wide strips, and stuck them to the rear panel over the output connectors. If you are going to build one of these with several different output voltages, it might also be helpful to use a different type output connector for each voltage. This supply is better than the wall-warts it replaces because all the outputs are regulated and have much less hum and noise. I would build another one if needed, but so far the one prototype has been sufficient, although there are times when all ten outputs are in use.